Design a happy experience for creating and trading interactive personal cards. Glitter was incubated by betaworks. We are a small team aiming at creating delightful experience on card trading in digital world. In long term, we hope this could be a new, fun way of making friends. As a UX intern in the team, I explored new features of Glitter app and interaction design of the website. During this exploration, I researched, designed, prototyped, and iterated on concepts with developers, product managers and designers. As we imagined, this is one scenario of how people introduce Glitter to friends when they meet. I was also involved in Glitter's website design. 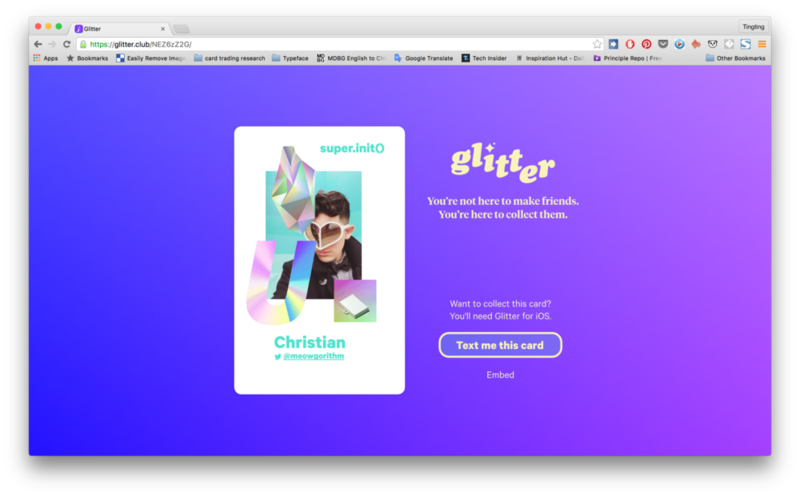 This website gives people a glance of how glitter works and our design personality.